Hello, friends. Is your car sounding a tad tired? Rundown? Anemic? Does your car poop out at Cars & Coffee, lost in the raucous chorus of rumbling V8s and high-flow exhaust systems? Are you and your car unpopular? The answer to all your problems is in the video above— Vitameatavegamin Flowmaster exhaust is a cure for a problem you didn’t even know you have. Designed for the 2016-2018 Chevrolet Camaro SS and 2016-2018 Chevrolet Camaro ZL1, the Flowmaster American Thunder cat-back system and Flowmaster Scavenger x-pipe kit take the Camaro’s throaty 6.2-liter LT1 V8—supercharged or not—and allow it bellow like an angry alligator on amphetamines. The Flowmaster system replaces the Camaro’s restrictive stock exhaust, giving the two-door a throatier note. The kit features Delta 40 and Outlaw mufflers with four-inch stainless steel tips. The exhaust comes with functional exhaust valves that work with the factory actuator motors so drivers can select between sound levels. There’s a Stealth Mode that will keep the neighbors happy and a Track Mode that is loud, and boisterous, and awesome, and will likely get the cops called. Flowmaster uses 409 stainless steel to build the system, which comes with a lifetime limited warranty. 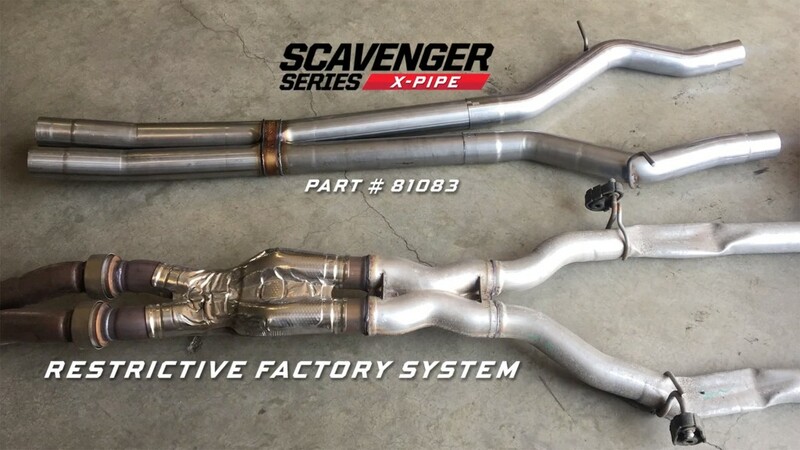 The two parts—the cat-back system and x-pipe kit—are compatible with the 2016-2018 Chevrolet Camaro SS and ZL1 with the factory performance exhaust option. Both accessories include all the necessary hardware and parts for installation. While the system is easy to install, the factory mufflers require cutting to remove. The system does not work with factory ground effects. Upgrading the exhaust is one of the easiest ways to breathe new life into your vehicle. Often, the systems are reasonably priced and easy to install. While a new exhaust may not make your Chevrolet Camaro look brand new, it will help it sound fresh, to the delight and detriment of your neighbors. Nothing sounds better than a Chevy V8 with a quality exhaust system. Flowmaster is #1 though. No sound clip. This blog page sounds rushed.